First item of note is that the new version of the Ph34r t3h cute ones t-shirt is now available. This is a remake inspired by the original Ph34r t3h cute ones image i did way back before Megatokyo really started, and the image and ideas that inspired the Piroko character. These shirts are kind of an experiment for us, and involve a 4 color process rather than the traditional screen printing approach. This gave me a lot more flexibility in coloring the image, and enabled us to get a multi colored image without needing 12 layers of ink to get it. We also have ladies t versions of the shirt on order and they should be in in a few weeks. Next item has a little bit of a story behind it. Like most mills that do runs of a complicated product for customers, Beiderlock made more of the original Miho blankets than were usually ordered in to have some on hand for reorders. There were several runs of this blanket before we moved to our own store, and recently they let us know that they still had a small quantity of these blankets in inventory if we wanted them. Rather than just take the small quantity of blankets that were left and sell them to the few customers who would notice them and snap them up, we decided to be fair to everyone and order them in sufficient quantity to take care of everyone. That said, The Miho Blanket is back available for purchase in the store. 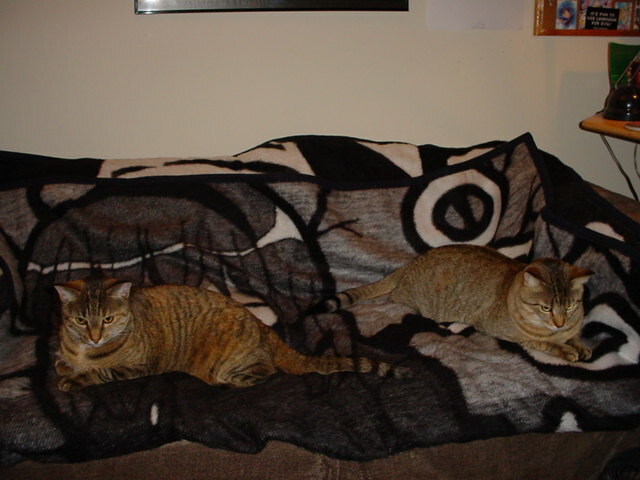 Made to the same high quality standards as the Kimiko blanket, the Miho blanket is warm, fuzzy, and approved by our cats. If you are familiar with Underpower, you are already familiar with the work of Vaz. Vaz and I are in a constant struggle over who is the more ansgty artist, and i have lost many rounds to him. We are proud to present Vaz's first shirt design, Angst-thulhu. Support the angst that is vaz, and support the cult of angst-thulu today! Also new in the store this month is the Applegeeks Squirrel Nut Attack mug. The front of the mug shows the most deadly of Ninja Squirrel attacks, passed down through the generations. Support AppleGeeks and the public awareness campaign warning of this deadly menace by purchasing one today. We also have some special promotions going on. For a limited time we are offering free shipping on Boo plushies! Basically, if you order a Boo plushie, we'll ship him to you for free! This enables you to order Boo plushies without having to pay for his deployment, but if you order other things, you'll still need to pay for the shipping on those items. We look at it as a kind of tactical boo deployment scheme. We still have lots of Boos looking for assignment. Don't forget that he squeeks when you squeeze his belly. It's his secret weapon. Don't forget to add stickers! Shipping on those is free too! You will also find that many of our older shirt designs are on sale, so be sure to check things out. Be sure to pick up one of these fine designs before they are retired! There. Whew. That was a lot of pimpage. It made my head swim. Thank you for your patience with such blatant shameless promotion, and if you do purchase stuff from us at the MegaGear store, please know that we here at MegaTokyo thank you for your support. In website and book news, the forums are STILL offline, and we do apologize for the downtime. There have been a number of issues in getting them back up and running, but these are mostly issues that we were going to have to deal with at some point anyway... we're just having to do a bigger overhaul than we planned to. So much for attacking it in stages, Nayuki wasn't having any of that. As soon as we get some more RAM into Akikio, we'll be ready to move things over. Realistically, we've targeted having things up by Friday. Thanks for your Patience. As for Book 4 processing... i still have a lot to do. I did get a good chunk of it done in my two week work break, but the trip to Sakuracon and other work that needed to be done for MegaGear kept me from resting much. :) I honestly am worried about my deadline, but i'm workin in, we'll see. I've met harder deadlines. :P As for the comic itself... Mondays comic was really hard for some reason. I think its that same old problem of getting out of the swing of doing it, and suddenly diving back in tired, unprepared, and expecting to just roll the thing off. Heh, serves me right for thinking that. Wednesday's comic should go better (i hope). Regarding the auction for the 4 Two Week dpds, my plan is to start the auction on Thursday and run them through Saturday and Sunday, April 15 and 16 (i'll try to stagger them a little). I've got to get back to work, today is turning out to be a very long day, but at least i feeel rested again. If you are interested in any of these four drawings, please take a look. Thanks for your support! By this time, I'm sure all of you have read about this story and have formed your own opinion on it--whether you shake your head in disgust and shame or if you calmly accept it. Given my stereotypically Californian political leanings, you can guess where I stand on the issue. But this rant isn't to talk about politics--you may note that I carefully avoid the subject of politics, since the mere mention of politics on the internet is an invitation to a firestorm. No, this is not about the society of terror at all, this is about my new goal in life. I want to be arrested as a terrorist in the silliest way possible. Now, just to make sure you guys understood me, I don't intend any violence toward anyone. Nor am I stupid enough even to joke about setting bombs off anywhere, since that's not protected speech. No, I want to be arrested because I'm wearing this shirt. I'm not sure what song I should sing to make myself suspicious yet. Singing The Clash has been done, so I may sing some Dead Kennedys. You know, walk along with a shirt that says "Genocide!" and singing "Kill kill kill kill kill the poor!" I might sing some U2, too, and just sing the parts of Sunday Bloody Sunday that sound violent, without the call to peace at the end, but U2's probably too well known. I need to learn more angry songs, I guess. I'm not sure why I want this--I do remember that in the wake of the Columbine massacre, I took to wearing a black trench coat with a big smily face sticker (or, at other times, Chococat and other random cuteness) to keep the image from souring too much. But my current theory is that I just like being stupid.